Joe Montana directs the San Francisco 49ers down the field in Super Bowl XXIII. When Joe Montana had the ball late in the game throughout his career it normally meant the other team was in trouble. 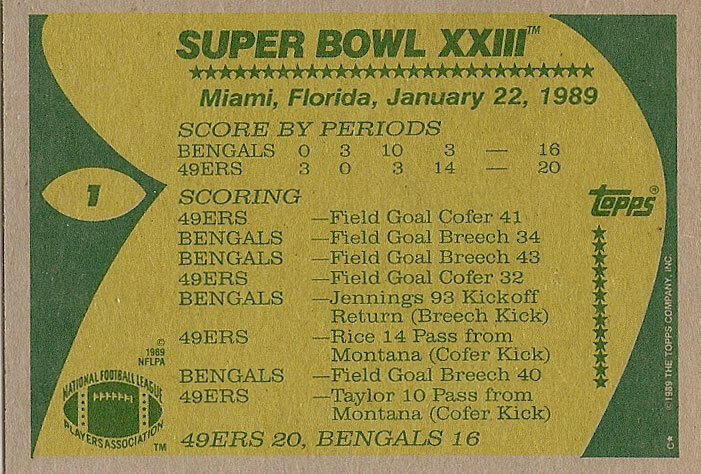 When he drove the San Francisco 49ers down the feld at Joe Robbie Stadium in Super Bowl XXIII it was beginning of more than two decades of suffering for Cincinnati Bengals. Montana embarked on his game winning drive with 3:10 left in the contest and 92 yards away from the end zone, At the time, the Bengals were on top 16-13. 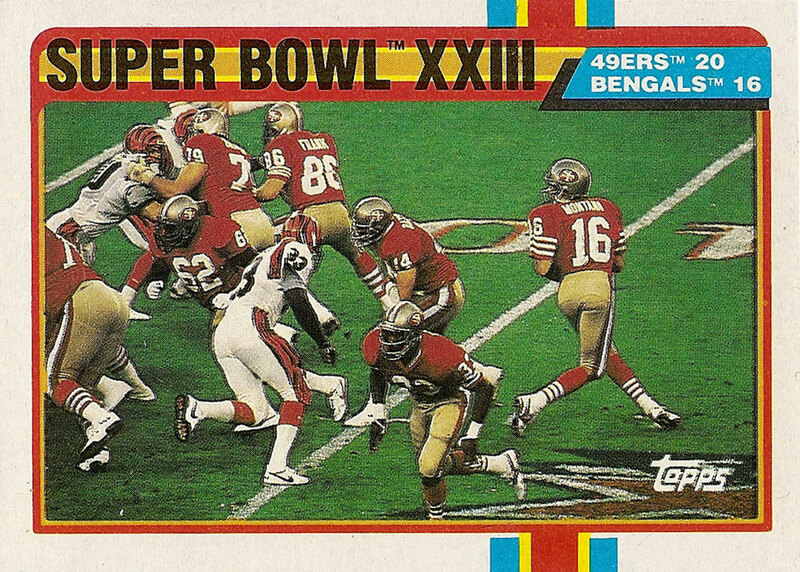 The 49ers pulled ahead when Montana found John Taylor for a 10-yard touchdown pass with 34 seconds to pull ahead 20-16 in one of the top Super Bowls played. For nearly three quarters the game was a defensive struggle. It nearly became the first Super Bowl in which neither team scored a touchdown through the first three quarters. Cincinnati was forced to settle for 34 and 43 yard field goals by kicker Jim Breech before Stanford Jennings ran a kickoff back 93-yards to give the Bengals a 13-6 lead with 34 seconds left in the third quarter. The Bengals could not find the end zone again against the bruising San Francisco defense. Running backs Ickey Woods and James Brooks were held to 79 yards and 24 yards respectively. NLF MVP quarterback Boomer Esiason was limited to 144 yards passing on 11 completions and one interception. Super Bowl XXIII proved to be the final game for Bengals wide receiver Cris Collinsworth, who retired after the season. Since this game on Jan. 22, 1989 the Bengals have appeared in just four playoff games and have only won one of them, a 41-14 win over the Houston Oilers on Jan. 6, 1991.